Trooper Phillips was born in Hyannis, Massachusetts on January 4, 1965 and grew up in Lancaster, New Hampshire. He was an avid runner and took part in the annual Special Olympics Torch Run as well as being on the 21st Century Committee for the town of Colebrook. He served his country in the United States Army Military Police Corps and was stationed in Panama from 1985 to 1989. He became a member of the New Hampshire State Police in 1990. 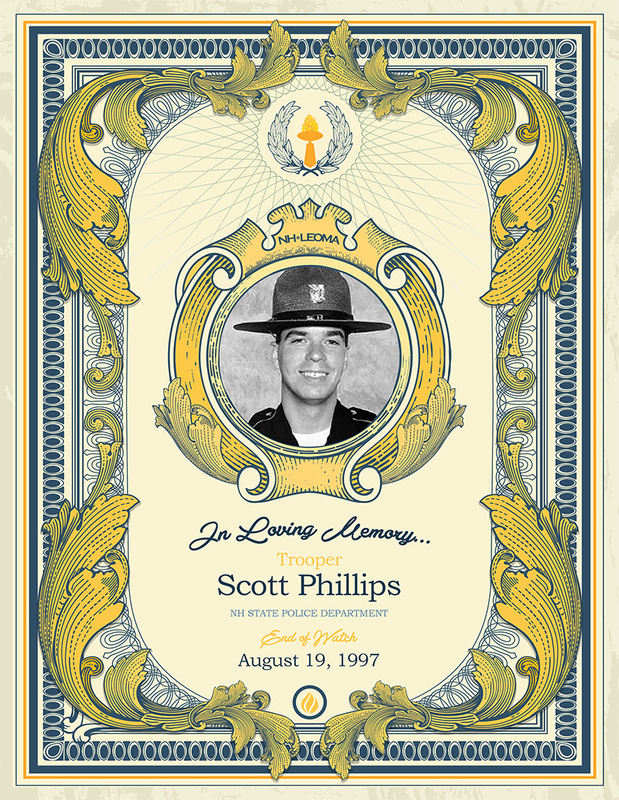 On August 19, 1997, Trooper Scott Phillips stopped a vehicle in Colebrook driven by Carl Drega. Drega got out of his vehicle and shot Trooper Phillips multiple times. Trooper Leslie Lord arrived at the scene to assist his fellow Trooper and was fatally shot before he was able to exit his cruiser. Drega then returned and killed Trooper Phillips. He was 32 years old. He is survived by his wife, Christine, his son Keenan, and his daughter, Clancy.